Your gums serve multiple purposes. Functionally, the gums surround and protect your tooth roots. Aesthetically, the gums outline the teeth and provide a natural frame for your whole smile. Sometimes, the gums extend too far over the teeth, making the teeth appear small and marring and otherwise beautiful smile. This condition is commonly referred to as a gummy smile. Fortunately, gummy smiles can be corrected with laser gum recontouring treatment at Contemporary Dental Health. To learn if the procedure is right for you, contact us today by completing the form on this page or calling 503-636-4069 to schedule a consultation with experienced cosmetic dentist Dr. Keith Ogawa. Our friendly office happily welcomes patients from across Oregon, including Lake Oswego, West Linn, and nearby Portland. Am I a Good Candidate for Laser Gum Recontouring? If you have a gummy smile, you are likely a viable candidate for gum recontouring. However, before you undergo this procedure, your gums must be healthy and disease-free. If Dr. Ogawa finds evidence of gums disease, you will need to undergo gum disease treatment prior to a gum lift. 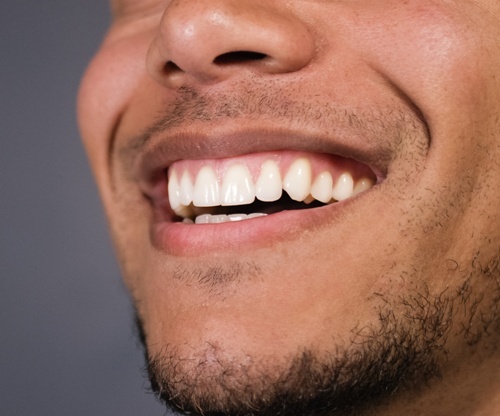 Gum recontouring can help you overcome the self-consciousness you feel when sharing a gummy smile. Many patients report a significant boost to their self-esteem following the procedure. The best way to know if a gum lift is right for you is to meet personally with Dr. Ogawa in an initial consultation. During this confidential meeting, Dr. Ogawa will discuss your goals and treatment options. He will determine if you are a good candidate for gum recontouring and develop an individualized treatment plan just for you. Beautiful, smile-enhancing gums can be achieved in just a single laser gum lift procedure. Dr. Ogawa uses the most advanced soft tissue laser to provide precise, healthy-looking results. This technology targets only the gum tissue you want to treat and leaves the surrounding tissue untouched. During the procedure, Dr. Ogawa targets and eliminates excess gum tissue. He will recontour your gums in a way that complements your teeth and improves the overall appearance of your smile. The procedure is entirely safe and comfortable, and the laser reduces bleeding and infection risk by sealing off blood vessels. For about a week after your gum recontouring procedure, you may experience gum sensitivity and mild swelling. Any discomfort you encounter can be easily managed with over-the-counter pain medications such as ibuprofen. If you are unhappy with your gummy smile, call Contemporary Dental Health today at 503-636-4069 to schedule a consultation with cosmetic dentist Dr. Keith Ogawa. We help patients from Lake Oswego, West Linn, Portland and nearby areas in Oregon.